Last week the U.S. launched airstrikes against a Syrian military installation, without debate or approval by the U.S. Congress or U.N. Security Council. President T rump said the airstrikes were in retaliation for a chemical weapons attack in Idlib. nst ISIS. In addition, U.S. and coalition airstrikes in Syria and Iraq have killed an alarming number of civilians in recent weeks. Staff from Syrian organizations that work with MCC have made clear that they strongly oppose the use of violence from all sides in the conflict, including chemical weapons, airstrikes and the bombardment of villages. Rather than fueling the flames of war, they urge support instead for a robust process of dialogue and diplomacy to address the root causes of the conflict. 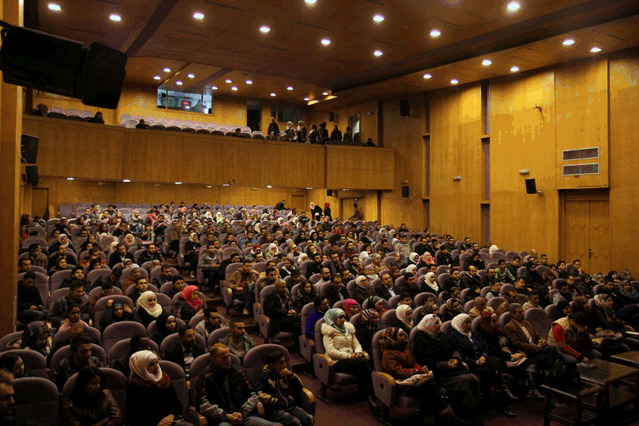 Photo: An interactive theater event in Aleppo, supported by MCC as a way to promote dialogue and conflict resolution skills. Photo courtesy of FDCD. On March 30, our office awarded the grand prize in our annual high school essay contest to Isabella Madrid of Eastern Mennonite School in Harrisonburg, Virginia, for her essay on immigration. Madrid’s essay “Love Your Neighbor,” shared her family’s immigration story and analyzed current problems with U.S. immigration laws. She will receive a prize of $1,000. National honorable mention prizes of $500 each were awarded to Abby Hochstetler and Simon Graber Miller, both students at Bethany Christian Schools in Goshen, Indiana, and Duncan Wanless of North Fresno (Mennonite Brethren) Church in Fresno, California. Photo: Isabella Madrid. Courtesy of Eastern Mennonite School. Criminal justice: On March 30, Rep. Jason Lewis (R-Minn.) introduced the Juvenile Justice Reform Act. This legislation aims to improve the Juvenile Justice and Delinquency Prevention Act of 1974 by providing more support for prevention services and programs. April 21-24:Last call to attend Ecumenical Advocacy Days in Washington, D.C.! Join us Saturday evening for a meeting with other Anabaptists attending the conference and look for our table in the exhibit hall. The conference’s theme is “Confronting Chaos, Forging Community,” looking at the intersection of racism, materialism and militarism, 50 years after Dr. King’s historic speech at Riverside Church. April 29: People’s Climate March in Washington, D.C.More details and sign-up link. March was a busy month for us! On March 10, staff participated in the Native Nations March and met with other Anabaptists who had come to Washington, D.C. for the event. Rachelle participated in the Peace and Justice Support Network Advisory Council meeting in Ohio in mid-March. Our office hosted Anna Johnson, recently returned from the MCC Palestine team, for meetings with congressional offices on March 15-17. Cherelle M. Dessus attended a pipeline to prison learning tour sponsored by MCC Central States in Louisiana March 19-24. On March 20, staff met with students from Williams College doing a senior thesis project on immigration policy. Staff met with master’s degree students in international development and economic development from Eastern University on March 21. Tammy Alexander attended a consultation for the Center for Sustainable Climate Solutions at Goshen College March 24-25, which brought together representatives from Mennonite colleges and agencies to discuss the future of the new organization.